Here I am today, years later, struggling for recognition of my own not-exactly-best-sellers. But unlike Lionel Hardcastle, who in the series would have stood on his head to avoid another appearance or book-signing that his enthusiastic publisher would arrange, I am a publicity-hound. I’ve written before about my attempts to self-promote–and unfortunately for some of you readers, you are the unhappy beneficiaries of these attempts. But in addition to blogging about my fiction, I do make serious attempts to reach out to potential readers whenever I can. This, of course, includes my pitch at scientific seminars that I deliver (and if you don’t believe me, you can ask one of our own about about the seminar I gave this winter in Toronto). But another source of my victims efforts is public libraries. Some time ago I was able to convince the Omaha Public Library system to purchase a few copies of my novels, and there are 4 of one novel and 2 of the other circulating among the city’s dozen or so branches. More recently, I made a concerted attempt to interest libraries in the towns and villages scattered across Nebraska and eastern Iowa. I searched for the emails of librarians, personnel involved in acquisition, websites with forms and so on for about 80 different libraries. I wrote or contacted them all. In the ensuing time since, I know directly of sales of about a dozen copies. And I received one invitation to come for a lecture/book signing about lab lit, mental health, science and more. So this past week, I drove out in my Prius 105 miles northwest of Omaha (and back on a couple gallons of gas) to the charming town of Norfolk, Nebraska. 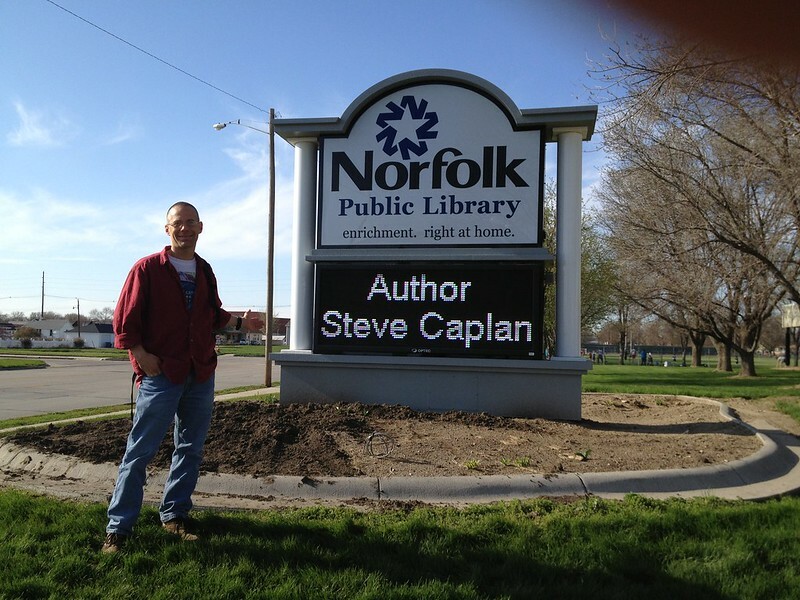 Norfolk is the 9th largest town in Nebraska with just under 25,000 people, and sports a very pleasant library, with a nice electronic sign to let people know of special V.I.P.s who have been invited for presentations. I learned that Norfolk, which sits at the north fork of the Elkorn River, had its name mangled at one point and therefore ended up Norfolk, rather than Norfork. This entry was posted in science, Uncategorized and tagged as time goes by, author, books, libraries, Nebraska, Norfolk, novels, promotion, self-promotion. Bookmark the permalink. Your efforts at self-publicity do you credit. Back here in realio trulio Norfolk, I have enrolled by LabLit gothick horror novel By The Sea in Kindle Select, which allows me to sell it for free now and then. I’m doing just that between 17 and 21 May to coincide with the Cromer and Sheringham Crab and Lobster Festival. Calm down Ricardipus. Cromer’s not that exciting. Ahh, such a pleasure to be among friends on this site. Truly a greenhouse compared to the nasty world out there on Occam’s Corner. Cromer is definitely on the list. My kids are in love with photos of Heidi the retriever. That is, if they let me enter the UK…. I expect that passports and customs people here are most unlikely to read the Guardian, still less comment on it.